I got my very first 8" Goodreau last week, Adeline Joy. 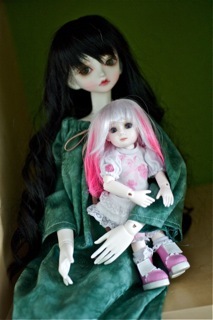 Truthfully, I wasn't sure I would like her, since I've collected mostly larger dolls (MSD and an SD size) up till now. Boy, was I wrong! I will certainly be adding more! I just can't leave her alone! She's wonderful--so sweet and cute, and incredibly detailed. I just adore her. I had to buy the Alice outfit also (that is where the braided wig came from), since I collect Alice themed items. I just love her. She's posing with my Peak's Woods Sky in the bottom two photos (for size comparison). Very cute, Allison! Congratulations on your new addition! She's quite cute! She looks like she's squirming around in Sky's arms like she wants to get down. 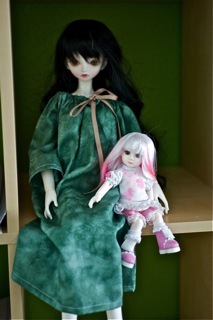 I am looking forward to getting some small dolls in the near future myself. So many people love them! They seem like great at posing too. Congratulations on your new addition Alison! She is a little cutie. I really like the blonde braids on her. Thanks, everyone--I have to say, I just ordered another one--a 5" size, from Bearzabout--yesterday. So bad!! Alison, she is absolutely adorable!! Who's next on your list? Lori in OR wrote: Alison, she is absolutely adorable!! Who's next on your list?